R2300 Supercharger featuring Eaton’s new TVS Technology. This F-150 supercharger Tuner kit by ROUSH is capable of delivering over 700 horsepower to the 2010-2014 Ford F-150 6.2L-2v V8 powertrain. 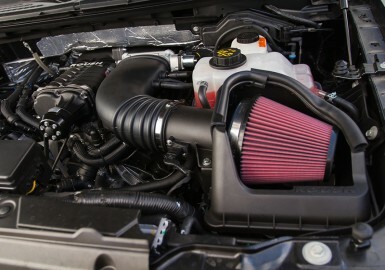 The ROUSH 2010-2014 F-150 Tuner Supercharger Kit is part of the TVS (Twin Vortices Series) line of superchargers developed by ROUSH that have raised the bar for performance and reliability. This is the same line that has been used and proven for years in ROUSH-built vehicles. The ROUSH R2300 supercharger features Eaton's new cutting edge Twin Vortices Series technology (TVS) rotating assembly that delivers more power and better fuel economy in a smaller package for uncompromising performance. The ROUSH R2300 TVS supercharger is a roots-type, positive displacement supercharger that features twin four-lobe rotors that are twisted 160-degrees. 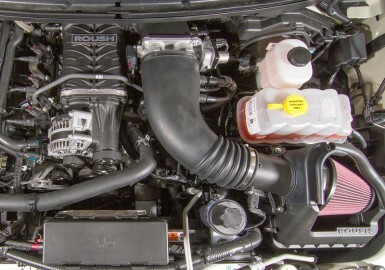 Unlike turbo-charging, the ROUSH R2300 TVS supercharger provides instant throttle response and can generate increased power through the engine’s entire powerband, capable of producing over 700 horsepower. This 2010-2014 F-150 6.2L Supercharger Tuner Kit features a bolt-on 75mm pulley which can easily be switched out for another pulley size. This kit is protected by ROUSH’s standard parts and accessories warranty, which is for 90-days from retail purchase date on ROUSH components only not including labor.